Cumbia Norte?�a was influenced by artist such as Pesado, Voces del Rancho, Los Tucanes de Tijuana, Intocable, and Groupo Control. Loops: This product includes live acoustic kicks, snares, hi-hats, toms, floor toms, cymbals, congas, tumbadora, cowbells, guiro and shakers. Easily Drop loops into your sampler or sequencer and instantly start producing or remixing your next Cumbia Norte?�a hit or remix. Samples: Included in this product are High Quality one shot McAllen drum samples and mapped instruments for Kontatk, Halion, SampleTank, Motu Mach5, EXS24, and Roland SPD-SX. Recorded: This product was recorded with DW Collector's Series Drums, Sabien cymbals, L.P. Congas, and L.P. Cowbells. These instruments were processed with Universal Audio Preamps using several high quality microphones including SM57, SM81, C414, D4 and Audix D6. 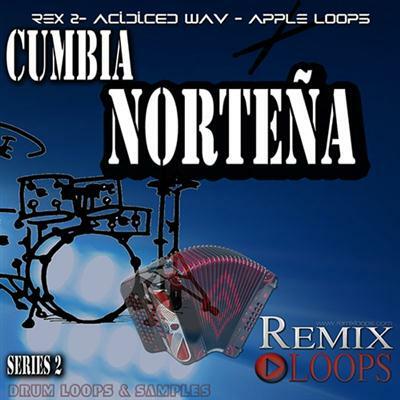 Cumbia Norte?�o was recorded, edited, mixed and mastered on Logic, Studio-one and Abelton Live. Recorded by Musicians from Texas, Mexico and California. Multi Formats: Wav, Rex 2 and Apple Loops so you can lock, speed up and slow down loops to your DAW bpm. Designed:These loops were designed for Music producers, DJ? ?�s, remixers, singer songwriters, live performers, drummers, electronic musicians or anyone looking for high quality Cumbia Norte?�a drum loops & samples. Compatible:MAC, PC or any sequencer or sampler that accepts Wav, Rex2 and Apple Loops including: Pro-Tools, Logic Pro, Abelton Live, Cubase, Studio One, Reason, Cakewalk, Digital Performer, Fruity Loops, and Garage Band. This is also great for ANY hardware and software samplers, such as EXS24, Halion, Emulator X, Native Instruments, Kontakt, Roland SPD-SX, and Boss loop station. This material was kindly provided by one of our users ! Thanks !